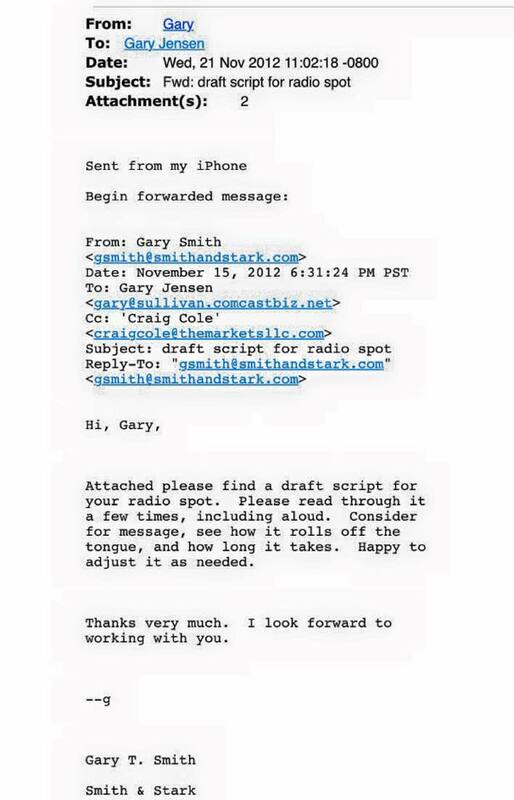 Below is a November 21, 2012 email sent to Mayor Gary Jensen from Gary Smith, a partner at Smith & Stark, a Seattle-based public affairs and strategic communications firm hired by SSA Marine, the company wanting to build and operate the Gateway Pacific coal terminal. SSA Marine’s local consultant/spokesperson for the GPT project, Craig Cole, was Cc’d on that email. 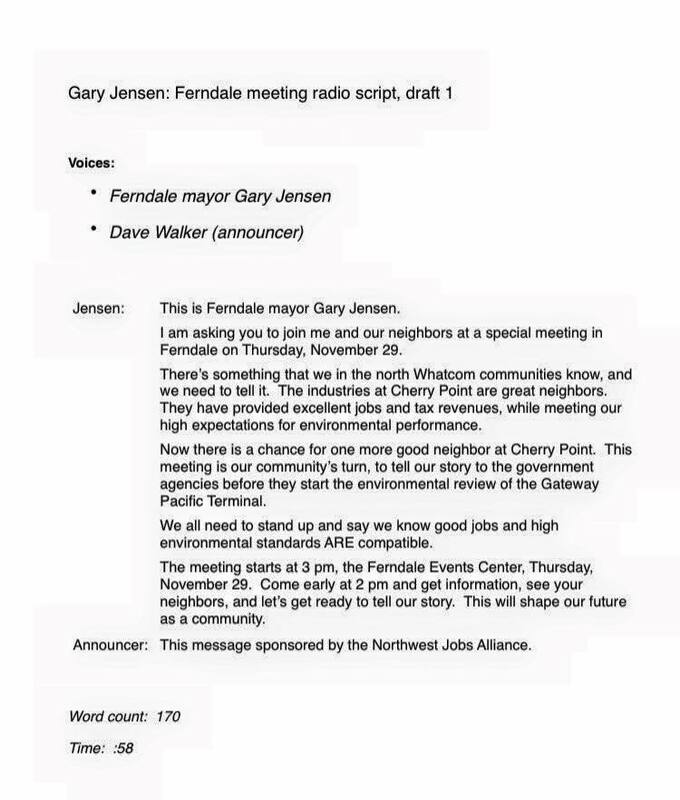 The email included a script for a radio advertisement for the November 29, 2012 EIS scoping hearing GPT project which Mayor Jensen would be reciting. At the end of the radio ad spot, the announcer reads, “This message sponsored by Northwest Jobs Alliance.” Northwest Jobs Alliance was specifically created by SSA Marine to promote the Gateway Pacific Terminal. If Mayor Gary Jensen wanted a job as a spokesperson for GPT then he could have resigned from his mayoral position and done that. He should have resigned as mayor instead of allowing SSA Marine to use him as mayor to try and sell their coal export scheme to Whatcom County. What a misuse of his elected office. What a disservice, not only to his Ferndale constituents, but also to Whatcom County residents in general. And now, Gary Jensen wants to be a Port of Bellingham Commissioner. That makes me wonder what are SSA Marine’s future plans for Gary Jensen? I don’t want to find that out, do you? You can read Sandy’s post on her Facebook page here. This entry was posted in Commentary, Facebook Post, Information and tagged Bellingham, Craig Cole, Ferndale, Gary Jensen, Gary Smith, Gateway Pacific Terminal, GPT, Port of Bellingham, SSA Marine. Bookmark the permalink.